Ibrox Noise: "Wheels came off" - would this one simple change resolve it? "Wheels came off" - would this one simple change resolve it? With goals being shipped recently left right and centre, Rangers’ defence is clearly not optimal. 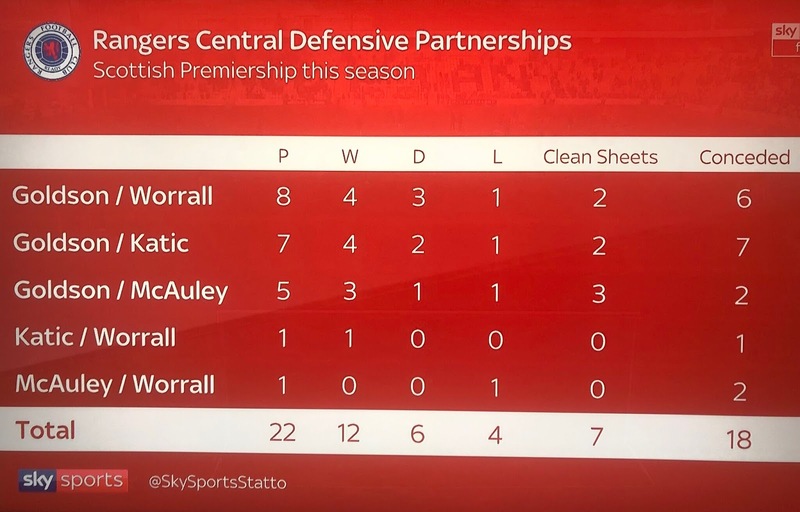 Its exposure against Killie at the weekend was probably the epitome of its problems under pressure in recent months, and while the little run a few weeks ago of clean sheets suggested progress, the poverty of the opponents and Rangers’ defence hardly being tested during them says different. 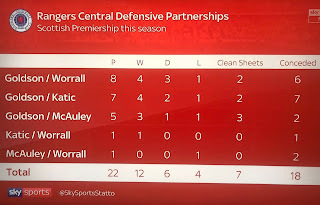 And with the likes of Hibs, Aberdeen and Killie all nabbing goals v Rangers (no clean sheets since 27th of February), there is no question the backline needs addressing. With Connor Goldson and Joe Worrall being Stevie’s duo of choice till Killie since 6th of February and that win at Pittodrie, results have varied – it only conceded two in 6 matches (both v Aberdeen), but then that run of Hibs, Aberdeen and Kille have seen 5 in four shipped, including a personnel switch of Worrall being exchanged for Katic. It had seemed Stevie’s chopping and changing at the back had reduced, given he’d appeared to plump with Goldson and Worrall, but once the wheels of that defence fell off, the Croat came back in to reform the old early season duo with Goldson. But, over the course of the season, while some duos have looked pretty good for spells, nothing has seemingly convinced Stevie enough to completely stick with it (suspension or injury notwithstanding) and we saw that again last weekend as Katic came in. It must be said Connor Goldson’s form has not been helped by all this chopping and changing again – Worrall, Katic and McAuley have all cycled as his partner, and one thing is certainly clear – Goldson is first choice when fit. Maybe that is already a mistake from Gerrard – persisting with Goldson and not giving him a rest. For what it’s worth, we at Ibrox Noise would love to see McAuley and Katic being given a run. An experienced head and a thunderous lion together might be a very fine combination if given a chance. But who would you like Stevie to persist with? Fair point Dave but I think Goldson and Katic have both shown they are capable of much better so I wouldn't give up on them yet. But I would absolutely be behind getting a more reliable centre half in and let the other 2 fight for the second spot. I'm afraid McAulay has been yet another bad example of signing old players well past their best. No more please. Good point. Goldson is too slow and is caught out of position too often. Katic needs to play more to improve but he is ideal for Scottish football as he is strong in the air and in the tackle, he very rarely loses an aerial duel. Tav is not a defender and never will be. Gerrard has been dabbling all season - don’t encourage him to try the only combination he has tried now! Clearly McAuley is getting past it for next season. Worral will be away too. Pity nothing in pipeline after initial rumours about Livingston Captain & former Rangers youth player Halkett. Arguably Gerrard has improved the situation from last year’s worst top 6 defensive record, but it still looks fragile at key points. We also had the best goal scoring record last year - but he has now made us too reliant on Morelos not replacing either Miller (until Defoe) or Windass. Our only hope, if there is no saviour for us next season is for Gerrard tonopen his eyes and start managing - our players rather than loan players.